A masterful marquetry of butterflies and tiny ladybugs adorns the lid of this charming white rubbed bird's eye maple musical box. A butterfly, ladybug and a few other friends play inside of a graceful border of ribbon and bows. 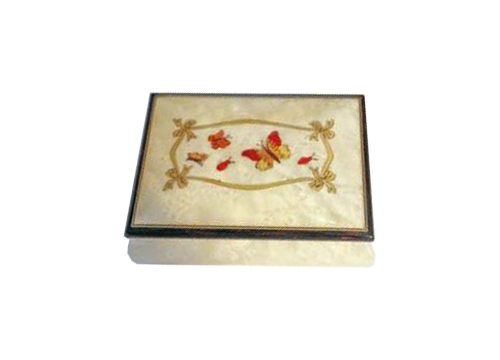 This is a beautiful beige lined box with ring compartment inside. The cabinet measures approximately 5 1/4" x 3 7/8" x 2 1/2".